Mathew his girlfriend Camila and their kids make their way through LAX yesterday, they make a great looking couple and their kids are cute as well. We all know Mathew has an obsession with a darker skin woman now his kids will be blessed with that as well, not mad at you, great catch. 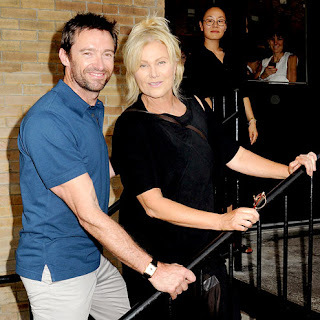 Hugh Jackman and his wife hit the town in NYC for a date night last night, IDK she looks older than he does, seems that Wolverine likes them older. Congrats to Lala for being honored at Planet Hollywood in NYC yesterday she is also promoting her new reality show " Lala Full Court Life", IDK Lala I hope it wont be drama filled, seems like reality shows let to many cats out of the bag and ruins relationships, so i hope you know what you are doing.